Tutorial 1. 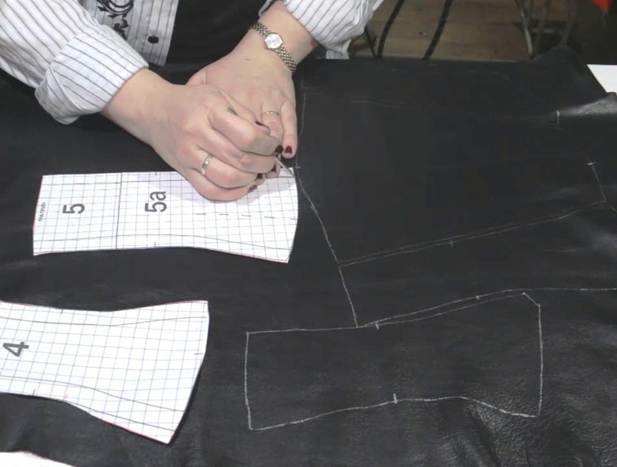 Applying Alterations to the Pattern. 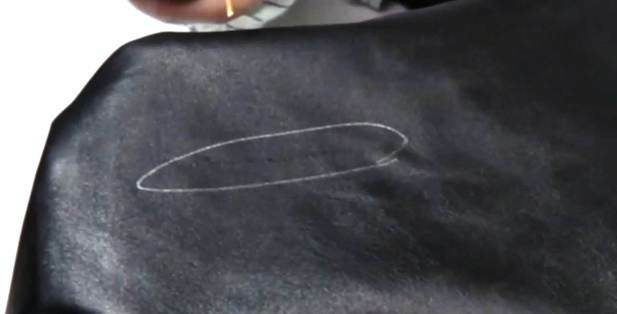 Marking Defects on Leather. Tutorial 2. 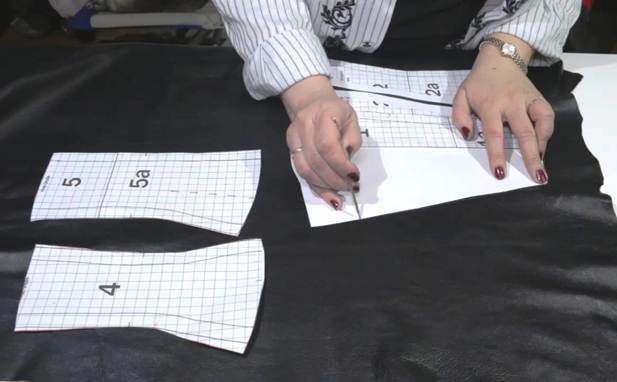 Cutting the Face and the Lining of the Corset. Assembling the Face. Tutorial 3. Opening the Seam Allowances of the Face. Tutorial 4. Pinning and Basting the Seams. Tutorial 5. Applique. Part 1. Tutorial 6. Applique. Part 2. Tutorial 8. Using Rivets and Snaps for Decoration. Part 1. Tutorial 9. Using Rivets and Snaps for Decoration. Part 2. Tutorial 10. 3D Applique. Part 1. Tutorial 11. 3D Applique. Part 2. Tutorial 12. 3D Applique. Part 3. Tutorial 13. 3D Appliqué. Part 4. Tutorial 14. 3D Appliqué. Part 5. Tutorial 15. Joining the Central Piece with the Lining. Tutorial 16. Finishing the Top Edge of the Corset with Bias Tape. Tutorial 17. Stitching the Bias Tapes. Setting Grommets. Tutorial 18. Inserting Bones in the Corset. Tutorial 19. Finishing the Hem of the Corset. Adding a Modesty Panel. Tutorial 20. Lacing the Central Panel to the Corset. Finished Garment. Transferring the Pattern. Duplicating the Leather. I am about to start sewing a transformer leather corset. It is an underbust corset like in the previous chapter. I will use the same patterns as for the first corset apart from the two front pieces which need a little remodeling. The central front piece will be whole and not divided into two laced together halves like it was on the first corset. I will make several versions of this central panel so I can create new looks without sewing a new corset each time. 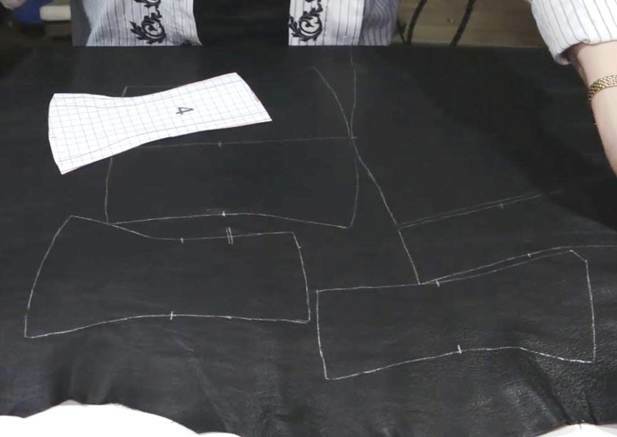 The central panel will be laced to the corset. There will be laces at the back as well. 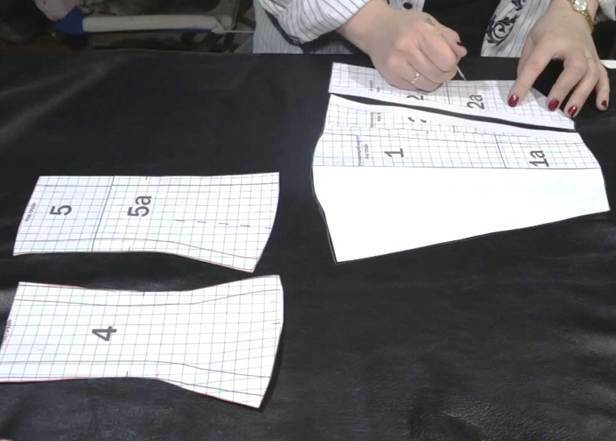 It is enough to print out the two front patterns to adjust the model of the corset. 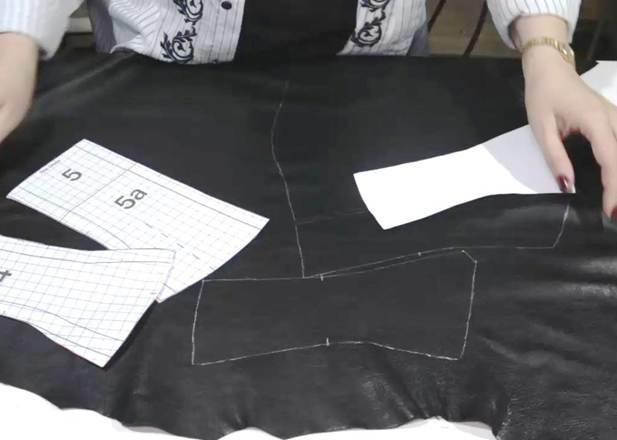 I adjust their length after the patterns of the first corset, trim away the seam allowance of the central seam because it will be a whole piece, and leave the seam allowances at the sides. I cut out the central front piece (piece 1) and pin it to the intermediate front piece (piece 2) aligning their sewing lines. I need to mark the border of the lacing area. Usually, there is about 2.5cm between the edge of the lacing bar and the edge of the grommet. I add another 1cm to make the new intermediate front piece wider. 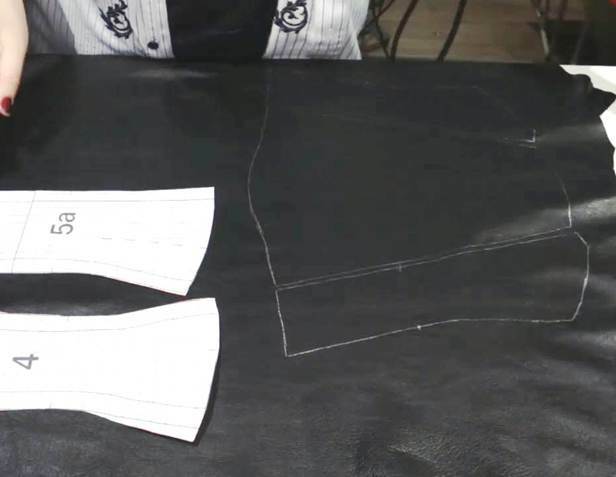 I draw a lacing line at an angle to give the piece a tapered shape (this kind of a silhouette will make the waist appear smaller). I cut up the pinned together pieces following the lacing line. 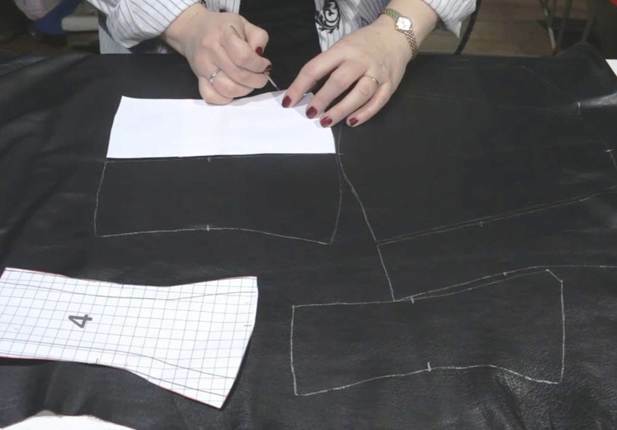 Now the front of the corset is made of two new pieces: the central piece with a fold line and the intermediate piece. All I need to do is add 1.5cm for the seam allowances and for finishing the lacing area. 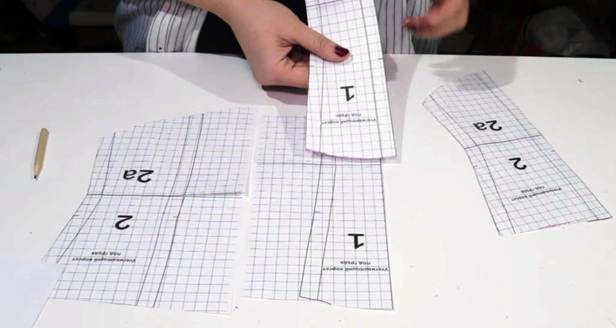 I will glue additional sheets of paper to the patterns to extend them because it is a lot better to cut a garment with seam allowances already accounted for. 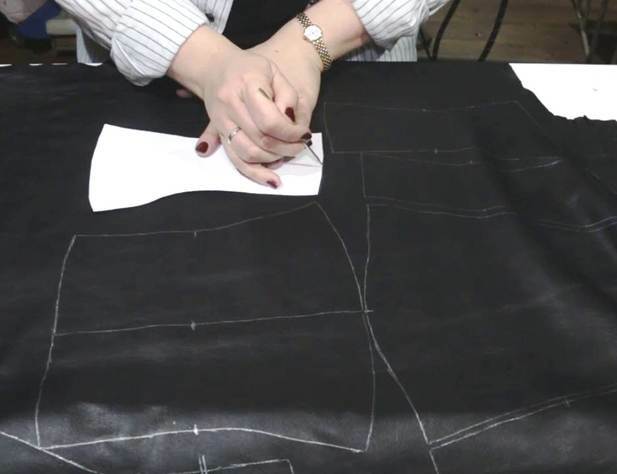 Remember to examine your leather for defects before cutting the corset. 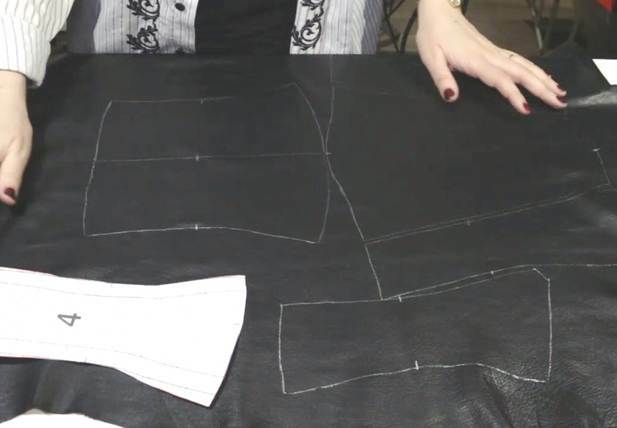 I will need two hides to sew a corset with several removable central panels. I carefully examine each hide in good lighting and circle all defects with a silver leather marking pen so I can avoid them when cutting the garment. Make sure to check the flesh side of the hide as well. You might often notice that some areas of the flesh side are not smooth enough. It is best not to use them. Duplication fabric will come off such areas, which may cause air bubbles to form on the face of the corset. When examining your hides, note the direction of the backbone and the location of belly parts. 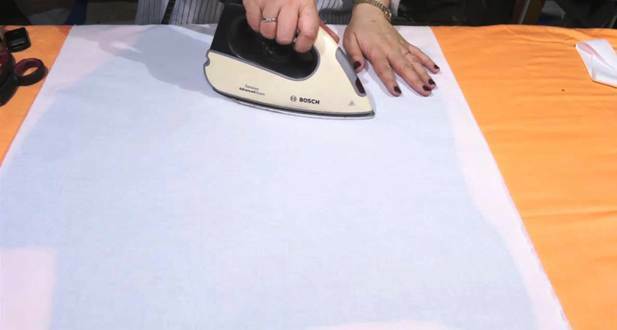 It is very important to account for it in the cutting. I start cutting the garment. First I will cut one set of pieces and then cut the rest of removable central front panels. I have added seam allowances to the adjusted central and intermediate front pieces. All other pieces are the same as in the corset from the previous chapter. I lay the pieces down parallel to the backbone, trace them, and mark all notches. There are no ceinture notches on the central front piece because there will be no ceinture on it. It is a purely decorative piece and there is no need in additional reinforcement: I will simply duplicate it with iron-on fabric. 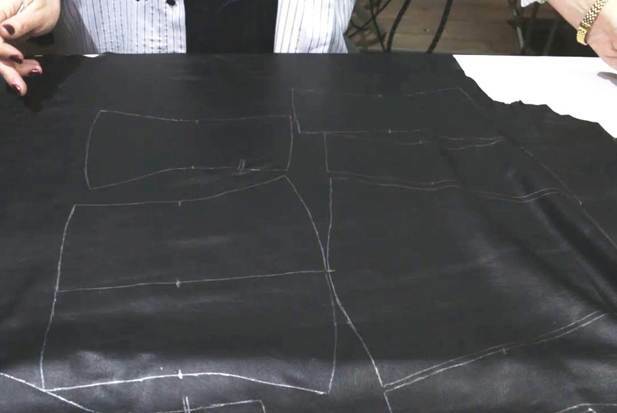 Remember that you should try to cut leather as efficiently as possible without deviating from the direction of the backbone too much. 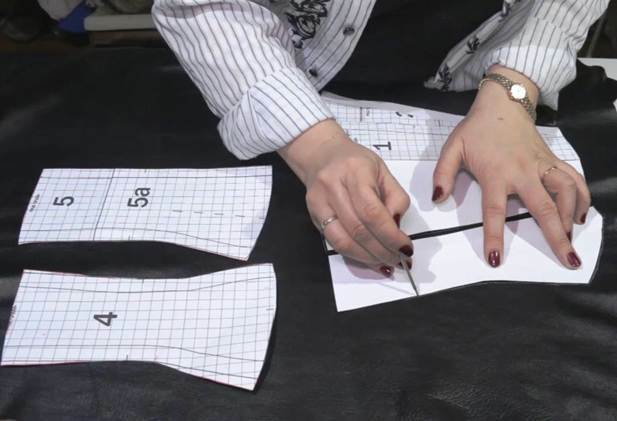 And don't forget to cut the second set of pieces flipped horizontally for the other half of the corset. I mark the side seam on the side pieces of the back (piece 4) to avoid confusion. Next I duplicate the corset with iron-on batiste. It is done the same way as on the previous corset. 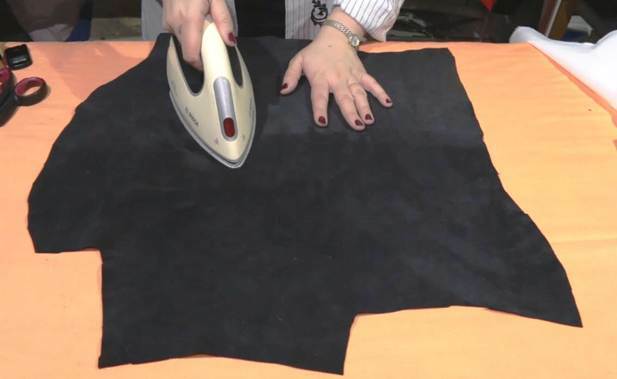 I remove the excess of leather to spare the iron-on fabric. I always step about 0.5cm from the marked lines when cutting leather. And then I fuse iron-on batiste over its flesh side. The batiste is lying with its lengthwise grain parallel to the backbone. I set the iron temperature to "wool."